Atul Gupta to challenge freezing of R10mln from personal account - SABC News - Breaking news, special reports, world, business, sport coverage of all South African current events. Africa's news leader. The National Prosecuting Authority (NPA) is on Thursday expected to oppose Atul Gupta’s application in the Bloemfontein High Court to challenge the freezing of R10 million from his personal bank account. The Asset Forfeiture Unit says the money was paid from the Estina dairy project which was meant to benefit poor farmers in the Free State. On February 19, the controversial, politically connected businessman filed an application to challenge the NPA’s forfeiture unit from freezing the money. “I wish to state at the outset that I am currently outside South Africa. I became aware on or about 2 February 2018 from some of the other affected parties who have been served with the order on or around 2 February 2018 that a preservation order has been granted in terms of which seizure and preservation of an amount of R10,000,000 allegedly in an unknown bank account of mine is authorised,” his affidavit read. He said his affidavit was prepared at “extreme haste” on February 7 and was signed and sworn at Dubai on February 8 at the South African Consulate General in Dubai, United Arab Emirates. On February 14, South Africa’s elite Hawks police unit confirmed arresting three people in a raid on the Johannesburg home of the Gupta family, who are friends of former President Jacob Zuma, and said they were conducting operations at more premises and expected further arrests. The Hawks, officially known as the Directorate for Priority Crimes Investigation, said the raid on the Gupta family’s compound in leafy Saxonwold was related to the family’s alleged embezzling of funds destined for a dairy farm in Free State province. The Gupta brothers Ajay, Atul and Rajesh are out of the country. On February 16, the Hawks said that Ajay Gupta, who was supposed to appear in the Bloemfontein Magistrate’s Court with eight accused was on the run. At the time, the Hawks said the country’s ports had been placed on high alert. 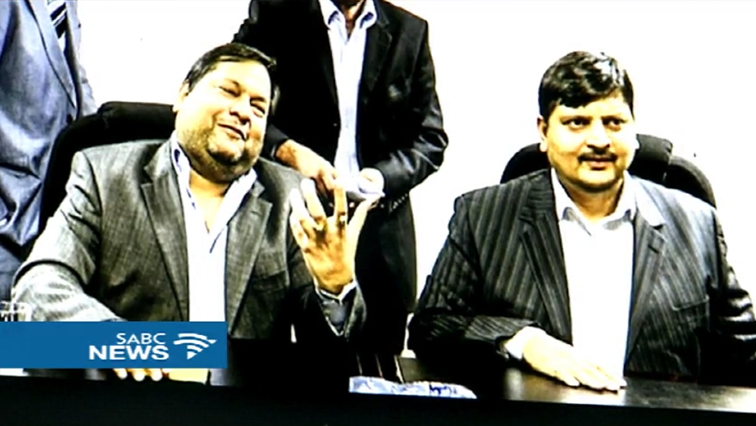 The oldest of the Gupta brothers has been warned to hand himself in “to avoid embarrassment”. The Hawks said they have a solid case against the accused, seven of whom have been granted bail of between R10,000 and R200,000. The case was postponed to August 17. At least R200 million in funds meant for emerging black farmers at the Estina diary project in the Free State allegedly flowed into the banks accounts of the family. Some of the money was allegedly used to pay for a lavish family wedding at Sun City in 2013. The family is being investigated by multiple law enforcement agencies who are hunting for more than R50 billion allegedly looted from parastatals. This entry was posted on 01 Mar 2018,06:47AM at 6:47 AM and is filed under South Africa, Homepage Latest Stories Slider, Homepage Featured Story Slider. You can follow any responses to this entry through the RSS 2.0 feed. Both comments and pings are currently closed.